Across more than 20 heating processes, our customers have seen the benefit of using precise induction heating brigs to the cost, etc. etc. Heating with induction is ideal for your process, combining the precision, control, economics, and safety inherent in the technology. 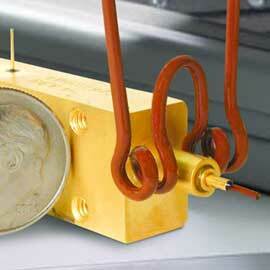 In fact, induction heating can be safer than traditional heating methods. Improve your heating processes without flame. When induction heating conductive materials, such as titanium, steel, or aluminum, energy is focused only where you need it. You don't need a torch or a costly batch or furnace process. Heat all your materials in a repeatable, precise flameless process. A major automotive manufacturer chose a competitive system based on purchase price but quickly found the applications support and system reliability to be unsatisfactory. An integrator needed to build four fully automated cells for metal-to-plastic insertion applications.